Background: Planned Parenthood teamed up with us to create a new tool that empowers citizens by keeping tabs on policy changes and track specific government officials in the Trump administration—including the President and Vice President—who are impacting U.S. healthcare rights. 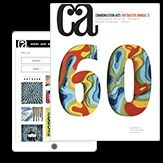 The 100-year-old organization is also currently investing more in digital products to extend its brand’s reach. Highlights: The concept was to create a visual map. We used Planned Parenthood brand colors and typography, and also took inspiration from minimal Japanese illustration styles. Users will also note that peppered throughout the new site experience are little hand-written pieces that give users a bit of shorthand. The internal pages focus on laying out what happened and why it matters. Challenges: The aim was to get the best possible product out into the world to help people, fast. 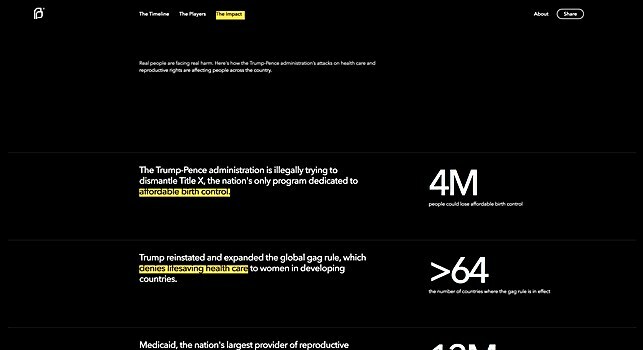 While we needed to make sure that the site was well-designed, the overarching goal was to be clear and utilitarian to ensure people are informed about the decisions being made by the current government that impact us every day. 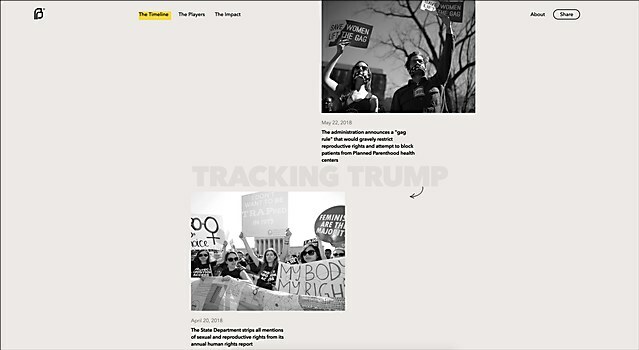 Navigational structure: We broke the navigation into three main feeds that reflect the “when,” the “who,” and the “what” for decisions being made by the Trump administration. It’s easy for people to scan when policies were put in motion, the officials behind them and how these policies impact our health and human rights. Our goal was to make the sure all the content was engaging, but very simple. Technological features: The site is built using React components for the front-end application, which is built on top of the Gatsby Static Site generator library that connects the underlying content data with the user interface components through a GraphQL interface. The application also leverages the Gatsby Static Site Generator, which combines the performance enhancements of a Progressive Web App with the load time efficiency of server side rendering. Time constraints: Working on a tight timeline meant it was critical to use an approach with a lean team of designers and developers who had worked together before. 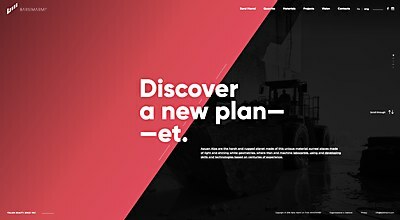 Our clients were very accessible, which ensured we had all the information we needed to create the most flexible design system. The Never Just A Smoke site empowers users to explore and re-evaluate their own social smoking habits. The website for this marble company achieves memorability with its two-tone color palette.